Domestic relations is a term used to describe an area of law having to do with marriage, child-rearing, and other family related issues. The federal government says of domestic relations law that, “The whole subject of the domestic relations of husband and wife, parent and child, belongs to the laws of the States and not to the laws of the United States” * and the states use this phrase as a shield to protect their unconstitutional actions in family law. * This sentence was first introduced into the legal lexicon back in 1890 in the Supreme Court case, In re Burrus. Burrus was a case where custody of a child was disputed between a sole surviving parent, the father, and the child’s maternal grandparents, the Burrus’s. After the mother died, the infant child went to live with the maternal grandparents upon a doctor’s orders. The father, upon remarrying and establishing a home in which to raise his child, sought to reclaim the child some years later. The grandparents refused to hand over the child, so the father went to a federal district court seeking a writ of habeas corpus to recover the child. The federal court granted the writ and returned the child to the father. The father took the child to the state where the father lived. The grandparents followed the father and took the child back by force and returned with the child to their state. The father then complained to the federal court and that court placed the grandfather in jail for violating the court’s orders. The grandfather filed for his own writ of habeas corpus with the Supreme Court and this case results. This case is one of jurisdiction or whether the court has legal authority to act as a court over this matter. It is important to understand that the federal government, and therefore the federal courts, only have that authority which the federal constitution provides. That constitution is silent on the matter of domestic relations. This means that the federal government has no direct power over domestic relations, that power remains reserved to the states under the Tenth Amendment. There is an exception to this you may encounter occasionally. The federal government does have absolute authority over federal territories such as Guam, Puerto Rico, and the District of Columbia and can regulate domestic relations in those territories as it sees fit. What the Court is saying here is that the actions of the grandfather did not occur because of any federal law nor did those actions violate any federal law. From that perspective, the Court was correct, and the federal district court had no jurisdiction to intervene in the domestic matter as it was argued. But, this introduces an important concept regarding the nature of courts. The federal courts and many state courts are absolutely restricted from issuing any orders or opinions where there is not an existing case or controversy before them. This is part of the separation of powers and the limits placed on government power under our federal constitution and under many state constitutions. Courts are incredibly powerful when they issue orders. However, they are limited to issuing orders only in the cases before them and only under the conditions in which the case is presented to them. In re Burrus occurred in 1890, a time of coverture, where women and children were considered property of their husbands and fathers. Many of the essential individual fundamental rights in our constitution were ignored at that time. The father in this case did not have the rich body of association rights law that we can draw on today. One of the concepts that Ron and Sherry Palmer of Constitutional Scholars Inc. have pioneered is the fact that the term domestic relations is just an antiquated term that means those intimate and expressive close family associations that are protected by the First and Fourteenth Amendments. Notice in the cited paragraph above, the Court mentioned that there was no complaint to the district court that the federal constitution had been violated. Given the rich body of case law we have today regarding family association rights, the father in Burrus could today argue that he has a constitutional family association right to possession of his child, that the grandparent is violating. The federal district court does have legitimate jurisdiction to determine the status of that right and the fact that the grandfather seized the child and crossed state lines would, today, introduce a federal element to the seizure of the child that would drastically alter the jurisdictional calculus in this case. One additional important element of this case is that it was brought against a private individual acting in their individual capacity. The introduction of the Fourteenth Amendment in 1868 allows the federal courts to impose federal constitutional limitations on state governments. 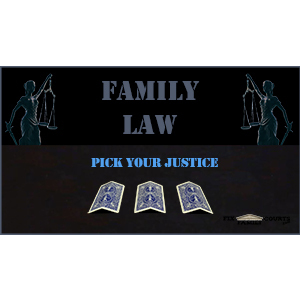 Had a state court or a state officer of any kind assisted the grandfather or protected the grandfather, that state action could be reviewed in a federal district court under certain conditions. Keep in mind that federal district courts are not appellate courts and they cannot directly review state court orders for errors. The last sentence of the above cited paragraph from Burrus tells us that the determination of child-custody is a state issue, and this is absolutely true. However, every single state action, law, and regulation absolutely must comply with the federal constitution. What this means is that while it is the state’s role to determine child-custody, the state must do so by means that are constitutional. States, state court judges, and many attorneys will tell you this isn’t true and cite Burrus to prove their case. State power over domestic relations is not without constitutional limits. The Due Process Clause requires a showing of justification “when the government intrudes on choices concerning family living arrangements.” (Supreme Court 1978).